Take risks this season! Love leather? Give the trend a try and rock it. 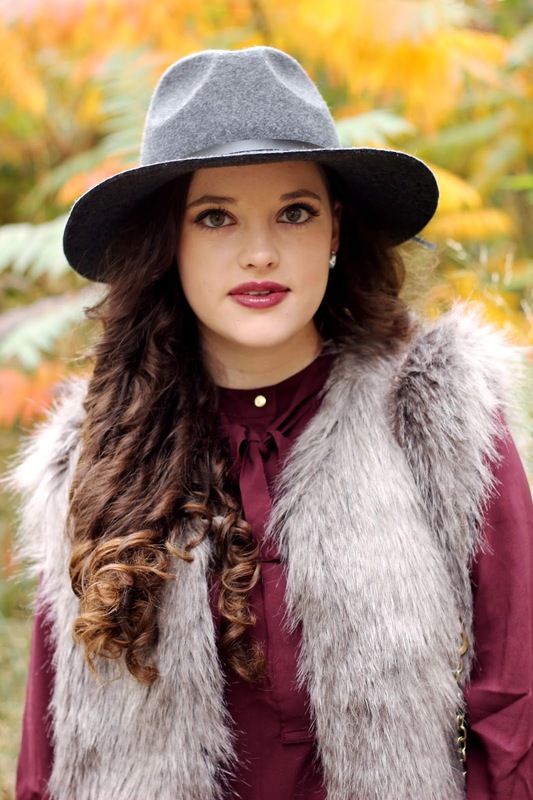 Got your eye on that fur vest but afraid you won't be able to pull it off? I say go for it (or shall I say fur it) and wear it with confidence. The holidays are such a fun time for outfit experimentation and showing off ;) So flaunt your feathers (and your fur) and shine this season in anything and everything your heart desires. I have to admit, I've never owned something quite so furry before. But the fur vest trend is so hot right now that I thought I should definitely give it a try. Some may think a vest like this is a little much, but I absolutely love it. It's a statement piece for sure but it's also a killer layering tool. Let me tell you, this baby is incredibly warm (coming from the girl who is always shivering)! It also fits underneath all my coats for when I need a layer of bear skin to protect me from these NYC winds ;) Grab the same vest here - now on a DOUBLE sale! A bow blouse like this is a great alternative to your typical collard button-down. This variation is just a tad more polished and unexpected. I love this deep burgundy color (especially for the holidays) and the round gold buttons make a luxe statement. But the best part about a blouse like this is that you can leave it untied for a relaxed, off-duty vibe, or you can tie it up for a slightly preppy, uptown feel. [vegan] Leather leggings are something anyone can pull off. Trust me! I love them for days when I don't feel like putting on real clothes. They're just as comfy as regular leggings but they have way more style clout and edge. Leggings this cool can be worn from the office (depending on your day job) to drinks and dancing come nightfall. These are the pants your wardrobe can't do without - just remember to wear them with attitude! Surprise! I'm wearing another hat. I can't get enough of them this season. This is my all-time favorite topper, I got it at Anthroplogie last year at Christmastime. It always seems to add that extra something to any look I'm styling. Sometimes it's hard not to wear it every day. 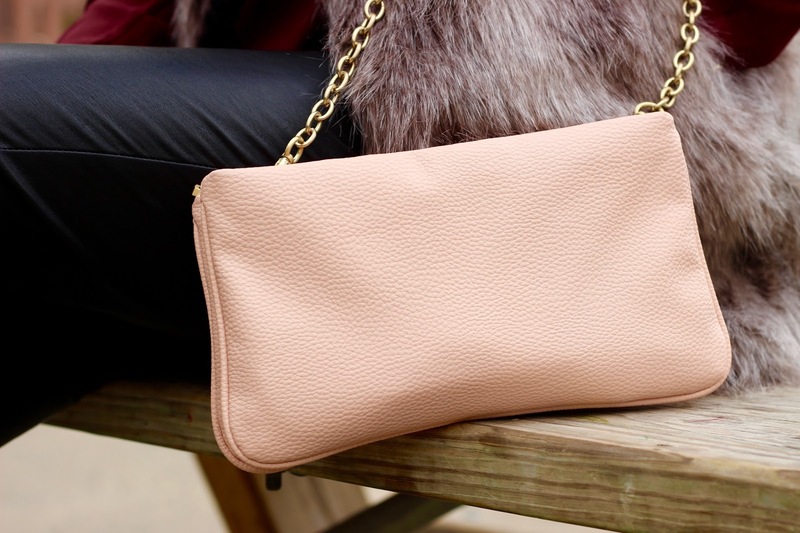 This blush purse/clutch is a fun and easy way to incorporate a pop of color into any look. Blush is a soft neutral that's feminine, charming, and always in style; an ideal compliment to just about any outfit. Since I'm not wearing a necklace, I wanted earrings that pop with a whole lot of sparkle and shine. These classic Kate Spade studs do the trick for me every time. How gorgeous is this Brooklyn Bridge backdrop? These photos were taken on a day when my friends and I spent a day in Brooklyn bopping around in bookshops, eating way too much Shake Shack, and taking goofy pictures like usual. Pictured with me below is Leah, one of my very best friends from college who moved to New York City along with me and tons of other people from our class after graduation. Leah has her own dope blog that you can checkout here. I highly advise you read it - she's hilarious. Forever 21 // Cyber Monday 21% off your next purchase + free shipping no minimum. just perfect. I love the fury vest. Great blog you have, stay inspired! I love the whole look dear. Great outfit dear,you look so lovely!! !Would you like to follow each other? ?Let me know on my blog,so I follow back with pleasure. Love your vest! 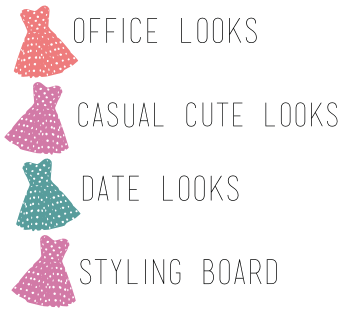 Look gorgeous! Amazing outfit, super combo!! Gorgeous outfit, I love it! Your rock this outfit girl love it! I love all of the details in this outfit! the fur vest, hat, leather pants...beautiful! This is perfect from head to toe! Love those leggings, girl! Happy Thanksgiving and happy shopping! I am pretty jealous of this gorgeous Brooklyn Bridge back drop! You look fantastic! 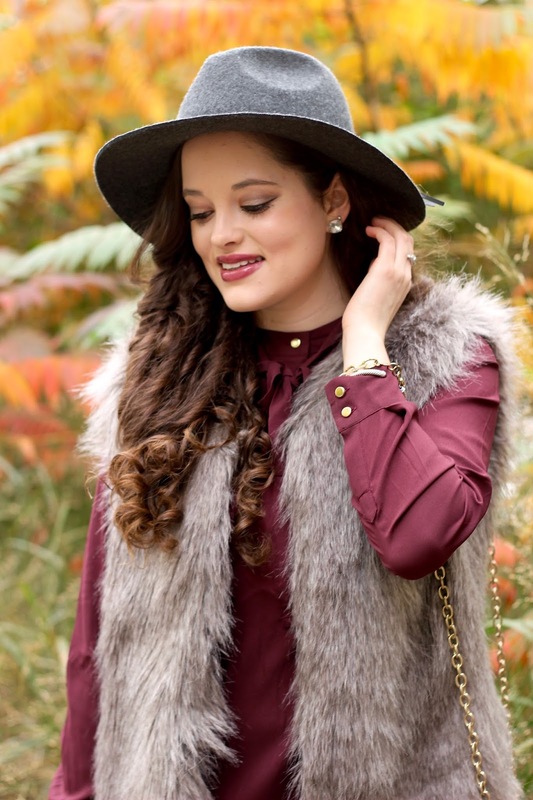 I am a huge fan of fax fur and so I adore this vest! I just can't get enough of this longer length of it too so perfect for layering. I do love those leather leggings too and of course you already know I love that hat! so far, this is my fav look of u! Maybe because it is so similar to my taste! So adorable! =) You look so pretty with that outfit and your hair is just stunning! Lucky! Do you wannna follow each other? I follow right back! 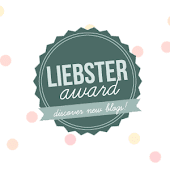 Based on your recommendation, I will surely check out Leah's blog! So nice of you to spread the love! You're always so stylish.... love your fur vest! I'm always such a fun of faux fur and I love that you're rocking the vest with that cute blouse. Such a perfect pair! I hope you had a nice Thanksgiving! I love fue vest too! I have similar vest and pants. Great combo Kat! "Go fur it!" Haha! Love it! You look so chic and stylish! Haha you guys looked like you had a great time. And you look so chic your fur vest. Kinda makes you feel like a Kardashian for a day. 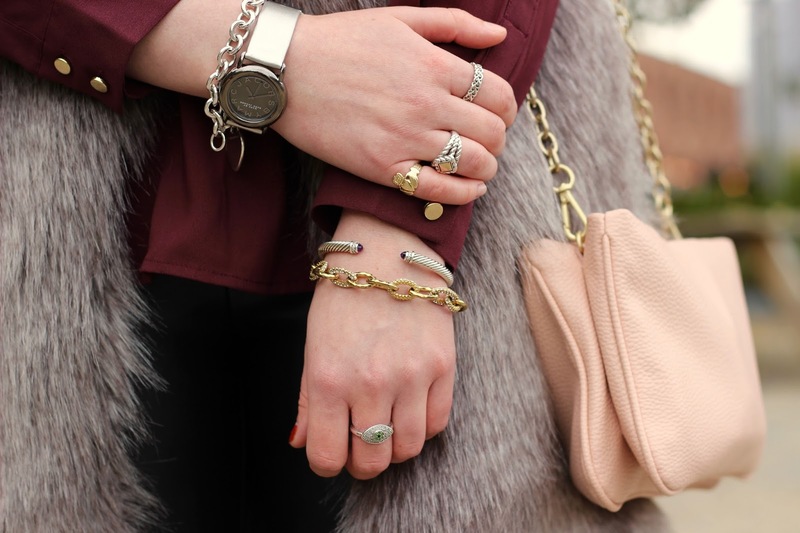 Love the fur, leather, and berry combo! Sleek, stylish, and perfect for fall/winter! A gorgeous outfit! The vest is especially stunning. Living and dying for this look! Been on the hunt for the perfect fur vest and still haven't found one I love yet! Will definitely be using this look for inspiration though. You look fabulous! A colorful long sleeve t-shirt is nice with the vest. Nice fabric - thick & slick - thought they might be thin material - was pleasantly surprised with the great fit. I didn't have to keep pulling these compression leggings up like my other pairs of yoga pants. I seriously need to get more of these.